Due to the thrust shortfall of the AX, and the range shortfall of the ALX, I have decided (after consultation with vstol jockey) to design a new, single-engined CAS fighter designed around the EJ-230. Another problem with previous AX design was its lack of close-coupled canards, caused by position of its turbofan engines. CAS fighter needs to be stealthy, very maneuverable at low speed, and able to quickly attack the opponent. This means small size, low wing loading, straight wing and high thrust-to-weight ratio. Close-coupled canards are also advantageous for maneuverability, takeoff/landing performance and safety. Cannon should be of revolver design, with relatively large calibre and high rate of fire. Another requirement is good endurance, achieved by high fuel fraction. Engine will be single EJ230 in order to reduce profile to minimum and allow good acceleration. Naval variant will weight 4.200 kg empty and cost 5,9 million USD. Here, I will compare ALX with A-10, Su-25, Pierre Sprey’s proposed CAS fighter (America’s Defense Meltdown, pg 161) and the “Blitz Fighter” by James Burton. ALX has an empty weight of 3.900 kg with 2.865 kg fuel (fuel fraction 0,42). With it, it has combat radius of 1.100 km, 550 km with 2 hour loiter or 235 km with 1,88 hour loter and 10 minute combat. Armament offers 21 gun burst plus 6 missile hardpoints, for a total of 27 attack passes. Thrust-to-weight ratio at anti-tank combat takeoff weight is 0,78, and wing loading 351 kg/m2. Unit flyaway cost of 5,5 million USD allows 182 aircraft for 1 billion USD, providing 546 sorties and 14.742 attack passes per day. A-10 is current US close air support aircraft, and only US fighter ever that was designed specifically for close air support. It has a combat radius of 460 km at 1,88 hour loiter and 10 minute combat. Armament includes single 30 mm GAU-8 with 1.174 rounds and 11 hardpoints, of which at least 8 can be used for carrying weapons. GAU-8 fires 52 rounds in a first second of firing, thus resulting in a total of 22 gun bursts; along with 8 missiles, A-10 can have up to 30 attack passes. Thrust-to-weight ratio at anti-tank combat takeoff weight is 0,38, and wing loading 406 kg/m2. At unit flyaway cost of 16 million USD, 1 billion USD budget gives 62 aircraft, allowing a maximum of 186 sorties and 5.580 attack passes per day. Su-25 is a Russian A-10 equivalent. It has a combat radius of 400 km at unknown loter time. Armament includes single twin-barrel 30 mm GSh-30-2 with 250 rounds and 11 hardpoints, of which at least 8 can be used for carrying weapons (same as A-10). GSh-30-2 fires 50 rounds per second, thus resulting in a total of 5 gun bursts; with 8 missiles, Su-25 can have up to 13 attack passes. At unit flyaway cost of 14 million USD, 1 billion USD gives 71 aircraft; assuming same sortie rate as the A-10, it allows a maximum of 213 sorties and 2.769 attack passes per day. Pierre Sprey’s fighter has an empty weight of 6.350 kg, with 4.536 kg of fuel. Combat takeoff weight is below 11.340 kg. 8.165 kgf of thrust give it a thrust-to-weight ratio midway through the mission of 0,9. Cost is conservatively estimated as 15 million USD, but realistic cost is 9 million USD, allowing 111 aircraft and 333 sorties for 1 billion USD. James Burton’s Blitzfighter has an empty weight of 2.530 kg with 770 kg of fuel, for a fuel fraction of 23%. With 238 kg of payload, combat takeoff weight is 3.538 kg, and combat weight 3.153 kg. It has 15,7 m2 of wing, and engine producing 2.291 kgf of thrust. Wing loading is 225 kg/m2 at combat takeoff weight and 201 kg/m2 at combat weight, with thrust-to-weight ratio of 0,65 at takeoff and 0,78 at combat weight. Only weapon is GAU-13 cannon with 350 rounds; this allows a total of 12 gun bursts. Combat radius is 240 km with no loiter. Cost is 2 million USD in 1979 USD, or 6,78 million USD in 2013 USD. More realistic cost of 3,57 million USD would allow 280 aircraft and 840 sorties and 10.080 attack passes per day for 1 billion USD. This entry was posted on December 7, 2013 at 8:10 am	and is filed under Uncategorized. Tagged: Close Air Support. You can follow any responses to this entry through the RSS 2.0 feed. You can leave a response, or trackback from your own site. Why do you insist on the GIAT cannon? I insist on revolver cannon because of its smaller size and, more importantly, quicker acceleration. Thanks for the link. I dare propose an internally carried version of the Grayazev-Shipunov GSh-6-30 (http://en.wikipedia.org/wiki/Gryazev-Shipunov_GSh-6-30). It is a 6 barreled 30 mm Gatling Cannon with a rate of fire of 4000 to 6000 rounds per minute 2 to 3 times as much as the Giat 30mm it’s 40cm shorter then the Giat and weighs only 29 kg more. It is also gas actuated not electrically actuated and there would not be any spin up times involved as it fires the first shot and the moment the trigger is pulled. It’s too awesome to be useful… seriously, just read on what is wirtten in that article about problems it caused. 1. Given the attack speed, would it be better not to have the wings somewhat swept (say 15 degrees)? Or have you decided that slow speed endurance is a better tradeoff than the attack? 2. Is it wise to have just 1 engine? On one hand, it does make it cheaper and easier to maintain, on the other, there is a greater risk of it being shot down with just 1 engine, although it is situated on the fin, so that may help somewhat. 1. Slow speed endurance is a must for CAS aircraft, as for attack speed it depends on situation. 2. I just finished second revision of this proposal… it is back to two engines as EJ-230 turned out too expensive. I read. The problems came mostly from the fact that it was used as a pod on aircraft that were not designed to handle the recoil, just like the GAU-13 on the F-16 . An internally carried one with appropriate bracing could, maybe, be as successful as the GAU-8 on the Warthog. Though it begs a question why it wasn’t kept on Su-25, some versions of which carried it internally. The simplest answer is that the Su-25 was not designed for it. I mean it’s the kind of weapon you build a fighter around like the A-10 around the GAU 8. Even if the Russians had developed a version of the Su-25 that carried this weapon internally (to my knowledge they did not), there was no way that they could fit the appropriate structural changes without basically making a completely new aircraft. The Su25 while conceptually similar to the A-10 is a completely different beast. Far starters it was conceived to be even more simple and easy to maintain and that meant not internal weaponry (not even chaff and flare dispensers these were added later as they started to be downed by muajhedin), everything is carried on the wings or bellow the fuselage (the gun pod). Secondly it’s a much smaller aircraft. It has half the empty weight and carries only half the payload. Now taking this into account a version of the Su-25 carrying a 6 barreled rotary cannon inside would have to sacrifice something to fit the cannon in (as there was no space available for it as there was not internal cannon to replace.). The only thing that comes to mind to sacrifice in this case is the armored bathtub around the pilots and I doubt it that any CAS pilot worth his salt would accept to sacrifice protection for firepower. To be honest, I’m not sure why the US insisted on using electric style gattling based weapons. The gas operated weapons weighed less, could have a faster maximum rpm, uses less power from the plane, and most importantly of all, the spinup time was faster. Andrei is right about the Su-25. 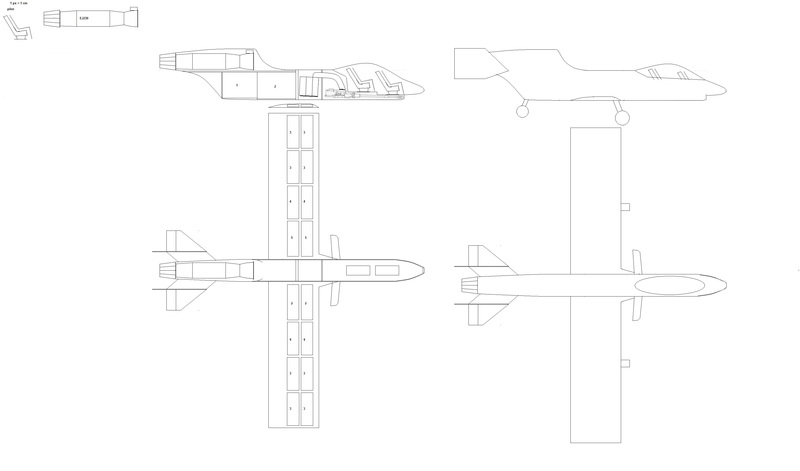 Designing an airplane around the Gsh-6-30 would require a larger aircraft than either your design and the Su-25. To be honest, I’d be open to discussion about putting a 40mm rotary cannon if that were the case versus a 30mm gattling cannon. Well gas operated Gatling weapons tend to have slightly more complicated mechanism which might take some time and skill to perfect. Russians are very good with mechanism, for example Russian watches tend to be second only to Swiss ones and it’s only lack of marketing and business sense that keeps them from being well known. Other examples would be Russian rockets. The early ones tended to have no electronics on board most automatics being gas operated, and you have to recognize that it takes some skill to design mechanisms like that. The expertize they developed over the past century with stuff like this, gave them the capacity to design the mechanisms for gas-operated Gatling style weapons and have them work reliably. American engineers on the other hand tend to dislike mechanical complexity and replace whenever they are capable mechanical components with electrical ones or electronic one (resulting in electrical/electronic complexity which the Russians hate as they hate anything that needs tools smaller then sledgehammers to fix 🙂 ). I think this is the reason why US has not developed a gas-operated Gatling weapon. 40 mm rotary cannon have not yet been created. The closest was the cannon of the T249 Vigilante ( http://www.quarry.nildram.co.uk/RED%20QUEEN.htm ) which was 37mm and the Hotchkiss revolving cannon which was also revolving but was hand cranked and had a rate of fire of 62 rounds per minute. Plane 2 could also be used to blow up bridges and buildings where needed (dive bombing perhaps). Rockets could also be mounted in pods. There’s an argument to be made that a FAC armed with 30mm guns could do most of part 2, but it’s entirely possible (as Picard noted) that a 30mm gun may not penetrate the armor of modern tanks, even though their rear and top are less well protected. Solution? Earlier, I proposed a heavier CAS airplane for specifically tank busting, say 40-45 mm guns. I think that high rate of fire will be needed for the critical 0.25 – 0.5 seconds that the burst occurs, but at the same time, the spin-up must be very rapid. Gas operated rotary weapons would be needed, or multiple non-rotary cannons with the rate of fire needed. They would need to penetrate the same area very quickly (some tanks could put reactive armor on top – so first round will have to blow the reactive armor tile, second round will have to land near the first round where the tile blew up, otherwise it will simply detonate the adjacent reactive armor tile). That way a penetration could be achieved. The 40-45mm is to ensure that the round that does hit the roof or rear actually penetrates. Once it does, it should be able to ignite the fuel and ammunition inside. The light weight fighter is based on the f-16 and at about $45 million each less what ever was paid in bribes to corrupt gov officials. So who knows what it was worth but $45 million aprox is what is being paid. The decision to purchase the F-35 was influenced by China and Japan. One has indigenous stealth and the other will buy the USA F-35 so Korea could not afford to be seen falling behind. And the problem with the islands and the flying zones, etc. The USA influence is also behind both deals. And to have no shortage of news the North Korea’s supremo just killed his uncle… or at least he has bragged that he did. Very nice string. Enjoyable reading of all those details. Andrei, can you throw some practical insight about operating attack planes in heavily defended environments? Meaning those defended by AA missiles of all stripes… how well do you think they could do and what counter measures can they take other than the flares, etc. that you already mentioned. I really don’t like the single engine and the piggyback style engine arrangement, firstly it block the real view of the pilot, the it may cause jettison a bit dangerous. The EJ230 is an over kill, and unsuited for its low by pass ratio. Yes, I came to the same conclusion and my next revision goes back to the first arrangement, with difference that it uses Gattling gun.